Today’s recipe is so full of flavour that you won’t be able to resist having seconds, so make a double portion for later. It is quick to make, so it is a perfect mid-week meal when you are short on time. Serve it with brown rice and your favourite steamed vegetables and you have a healthy, quick, and delicious meal. Good health starts in the kitchen. From my kitchen to yours, Bon Appétit! Heat a large deep frying pan, over medium heat, and add olive oil. Add the ginger and lemon juice, and stir. Place the halibut steaks in the pan, cover and let simmer on medium to low heat until fish is cooked. Fish cooks really quickly, so this should only take about 5 minutes. 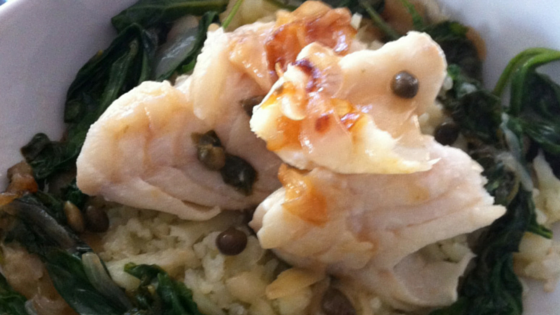 Place fish on serving plate and drizzle with sauce leftover in the pan.